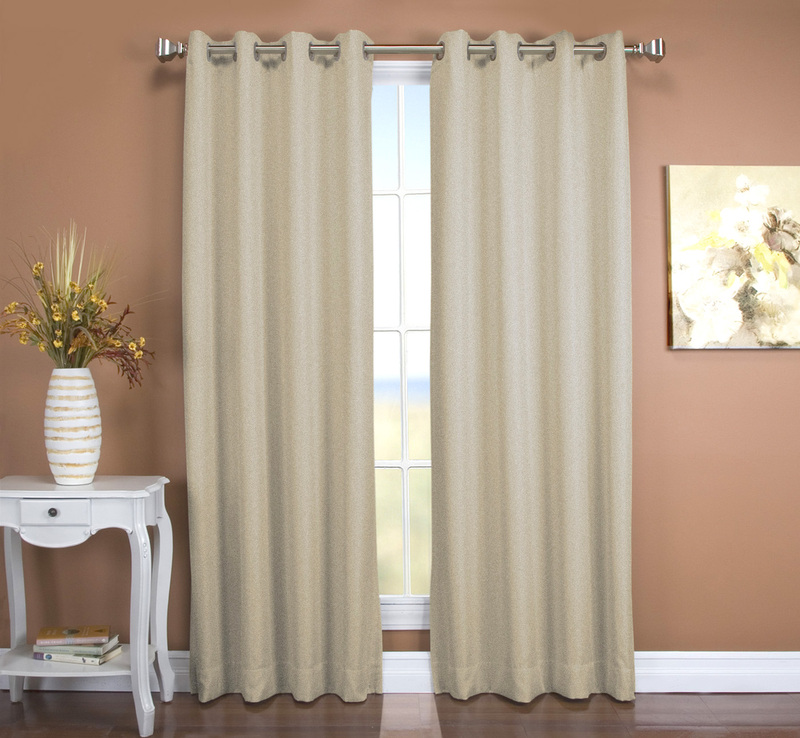 Sunbar Grommet Curtain Panel brings casual warmth and beauty to any room in your home with its triple layer feature. For an attractive textured canvas-like face fabric, Sunbar provides the ultimate in energy efficiency, noise reduction, and air barrier with room darkening characteristics. Fabric face and Inner lining is 100% Polyester and backing is Acrylic. . Additional features a detachable wand, 4 inch bottom hem and weighted corners! The Patio Panel measures 106 inches wide by 84 inches long. Matching 52 inch wide panels are also available. Colors: Floral Rose, Parchment, Driftwood, and Stone Tacoma Grommet Panels are made of 100% Polyester with a poly/cotton lining. Machine wash in cold water on delicate cycle, line dry, and touch up with warm iron as desired. The Conrad Thermal Grommet Panel features a pretty medallion distressed pattern printed on a Polyester that looks much like Cotton, but is easy care and machine washable. Each panel has eight Matt Silver Grommets with a 1 9/16 inch inside diameter. Fabric face is 100% Polyester, the back is 96% Rayon and 4% other. Use a decorative up to 1- 3/8" diameter. Other features include 3 inch bottom hem and 1 inch side hems. Colors include Beige, and Grey. Bring a welcoming casual warmth of any window in you home! For an attractive textured canvas-like face fabric, Tacoma provides the ultimate in energy efficiency, noise reduction, and air barrier with the enhanced black out capacity. Both fabric faces, as well as the 180 GSM white lining are woven with black out yarns. Additional features a generous 4 inch bottom hem and weighted corners! 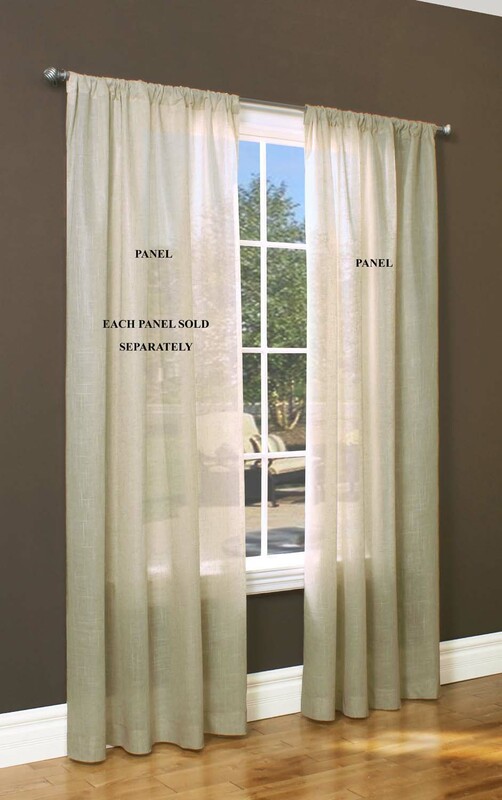 Each panel, sold separately, measures 50 inches wide and is offered in lengths of 45, 54, 63, 84, and 96 inches. Matching Patio Panel measuring 106"W x 84"L is also offered. Tacoma Grommet Panels are made of 100% Polyester with a poly/cotton lining. Machine wash in cold water on delicate cycle, line dry, and touch up with warm iron as desired. 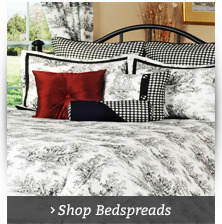 A striking medallion fabric design of soft raised flocking in Black on and rich Cream ground. The richness of the velveteen-like black flocking makes Sumtra a unique choice for any window in your home. This beautiful Pole Top Panels measures 52 inches wide by 84" long and features a 3 inch rod pocket and 2 inch header, one inch side hems and 3 inch bottom hem. It is fully lined and is washable. The fabric face is made of 52% Polyester and 48% Polyamide while the lining is 100% Polyester. Functional as well as decorative, Spanish Steps features a unique block design forming a stripe structure in wonderful mid-tones that initiate a relaxed harmony to your home. Layers of black yarns are woven between layers of colored tones to produce a healthy room darkening fabric that drapes perfectly while controlling harsh sunlight, privacy, and energy efficiency. The 1-1/2 inside diameter metal grommets promotes easy opening and closing on a decorative curtain rod not more than 1-1/4 inch in diameter. If you are looking for an attractive grommet panel in easy to decorate with colors that is room darkening, draft blocking, energy efficient, light controlling, private, and simple to open and close, then the Spanish Steps Grommet Curtain Panel is for you. Made of 100% Polyester, and machine washable in cold water on gentle cycle, and tumble dry on low. Use a warm iron for touch ups. Two 54" wide panels fit a standard single window. Use multiples to accommodate wider windows, allowing at least one-and-one-half times your curtain rod width for proper fullness. Color selection includes Garnet, Cypress, Slate Blue, Taupe, and Wheat. QUANTITIES ARE LIMITED. Functional and decorative describes our insulated Hometown Insulated Grommet Panels. Solid colors go with most any decor in your home. Made of 100% Polyester. Backing is made of heat-bonded acrylic foam for maximum insulation. Panels are 54" wide. Select from lengths of 63", 72", 84", 96, and 108". 84" length also comes in a 108" double wide Patio Panel. Hometown insulated panels are machine washable on gentle cycle and cold water. Tumble dry on low heat. Use a cool iron for touching up as needed. Grommets: Brown has Gun Metal Grommets, Taupe has Antique Brass Grommets, Aubergine and Dark Teal has Brushed Silver Grommets, each measuring 1 9/16" inside diameter. Woven vertical squares form a grid design in this handsome fabric design which looks fabulous in any room in your home. Darcy, a Thermaplus product, features awesome insulationin a basic solid color panel. An insulating acrylic backing provides energy efficiency saving you money on your energy bill by minimizing drafts. It also helps retain heated or cooled air inside your home. Grommets: 8 Silver metal with 1 9/16" inside diameter. These beautiful grommet curtain panels feature a woven tone on tone geometrical design and is lined with a soft acrylic suede backing. They look great in any room in your home. The backing blocks outside light, minimizes drafts, and helps protect your furniture and rugs from fading. 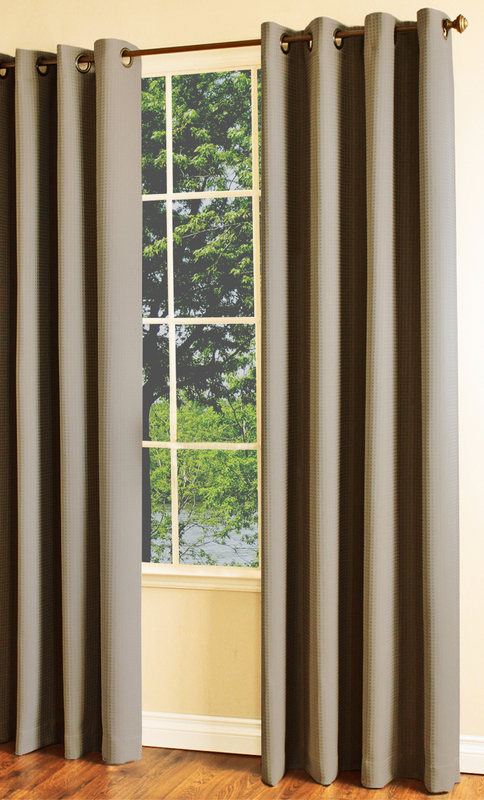 By using insulated curtains you'll live more comfortably, plus help save money on energy bills. Washable. Iron with damp towel on the fabric face ONLY, to remove wrinkles. Do not touch backing with iron! Use two panels for a standard single window. This lovely linen blend panel looks great plus its double lining will keep you warm and snuggled during the cooler months. It's great for summer too, insulating against damage from harsh sunlight, easily blends with any room decor. Hang this beautiful Homespun Grommet Panel on a decorative rod and you will love its full, pleated look! Antique Brass grommets have a 1 9/16" inside diameter. Machine wash cold water, gently cycle Line Dry, touch up with warm iron. Grommets: Antique Brass with 1 9/16" inside diameter. 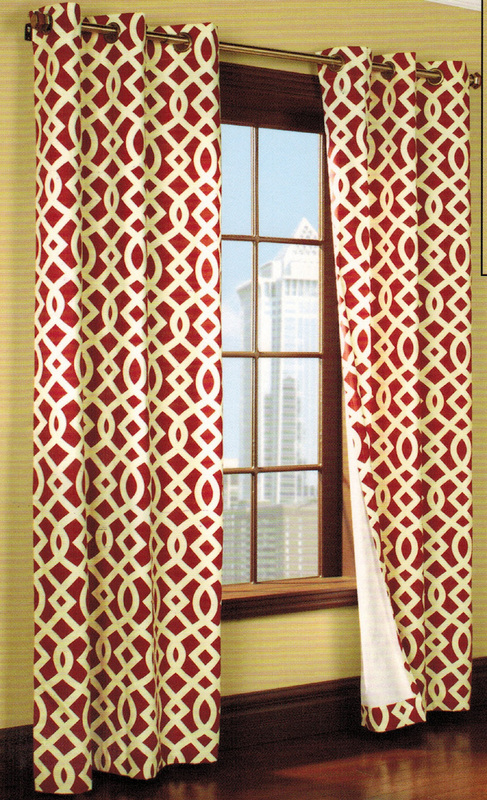 Trellis Thermalogic Insulated Grommet Top Curtain Panels features a striking trellis design. Pair it with Weathermate Solid Color Grommet Panels to get that custom decorator look on wider windows. Panels are sold in pairs. Fabric face is 100% Cotton Duck, Backing is 100% Acrylic Suede. 1" side hems and 3" bottom hem. 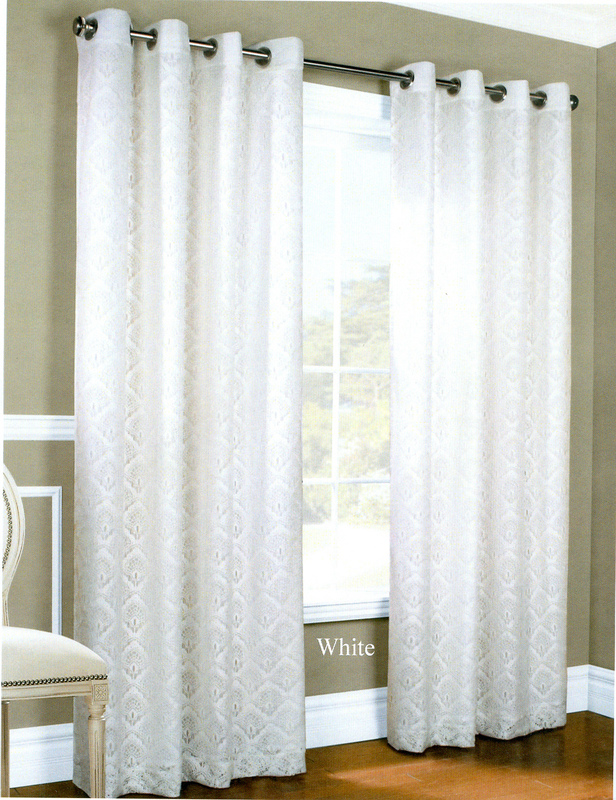 Each panel is 40" wide (two panels per package); use a decorative curtain rod as seen in the main picture for hanging. Machine Washable in cool water. * Energy saving, keeping out the summer heat and the winter cold, saving you money. * Acts as a sound barrier so you can enjoy more peace and quite. * Reduces glare on computer monitors and TV screens. * Back side is white to accommodate condominium requirements. A decorative rod is required, up to 1 1/2" diameter. Inside diameter of grommets are 1 9/16". Elegant and insulated window panels, Elegance resembles luxurious taffeta, but is heat bonded with acrylic foam backing for maximum insulating capability. Two panels will fit a standard single window. Use multiples to accommodate wider windows. Panel has eight grommets. Panels sold separately, one per package. Made of 100 percent polyester. Machine wash cold water, gentle cycle. Tumble dry on low heat, Cool iron as needed for touch-ups. Elegance insulated window panels let you have it all: a beautiful curtain that also works to keep your heating and cooling costs under control. Insulated curtains are a low-cost and effective way to keep the inside temperature constant, blocking warm air from entering or leaving through your windows so you don't need to adjust the thermostat so often. The foam lining even helps with noise reduction by softening sound waves as well. Elegance insulated window panels feature grommets for easy, attractive hanging in any room in your home. With Elegance curtains from The Curtain Shop, choosing insulated curtain panels means not having to choose between beautiful-looking window drapes and being energy-conscious. 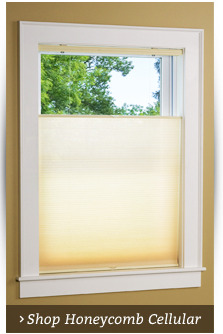 Functional and decorative, Miller is an exquisite double layered insulated window treatment. Better yet, it's reversible! One side is your choice of Gold, or Lilac (plum). The opposite side is Natural. Each side is a lovely faux silk. Each panel has eight Silver metal grommets with 1 9/16" inside diameter, knife edge sides and bottom. Front and back layers are made of 100% Polyester. An Acrylic Suede inner lining is sandwiched between to keep the warm air in your home in winter months and cool air in during summer months. 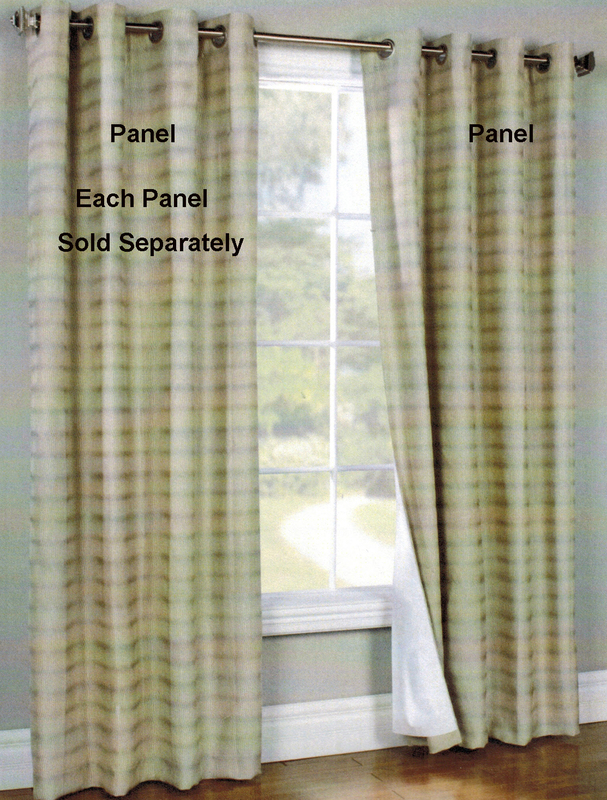 Panel pair measures 108" wide (two 54" wide panels) and is offered in three lengths: 63", 84", and 96". Panels are as a pair. Colors: Natural, Blue, Mushroom, and Brown. Grommets:Antique Brass metal grommets with 1 9/16" inside diameter. Prelude by Thermalogic is a beautiful soft and luxurious faux silk on the front, with a tough working thermal layer on the back which keeps cool air in during the summer heat and warm air in during winter, which saves you money on your energy bills. Prelude Thermalogic panels also act as a sound barrier so you can enjoy more peace and quite. It also reduces glare on computer monitors and TV screens, and protects carpets and furniture from sun fading. Prelude Thermalogic panels have a white backing to meet condominiums requirements. 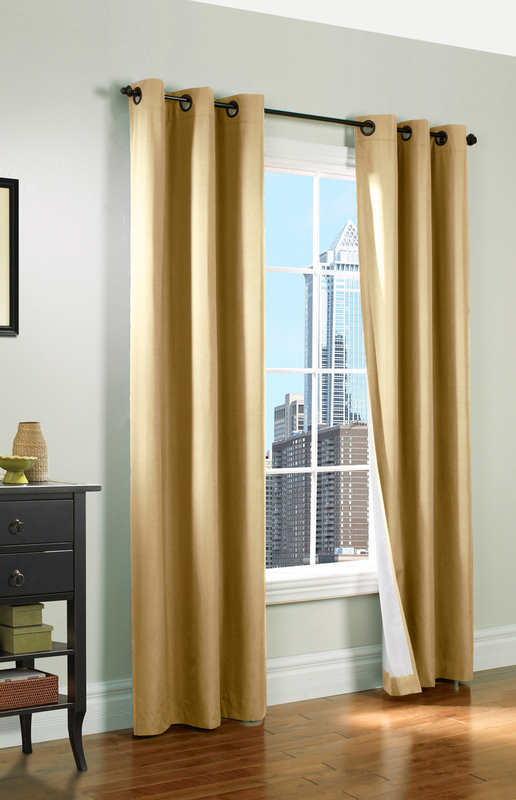 Our Prelude Grommet curtains are designed to fit widths up to approx. one half the width of the product. 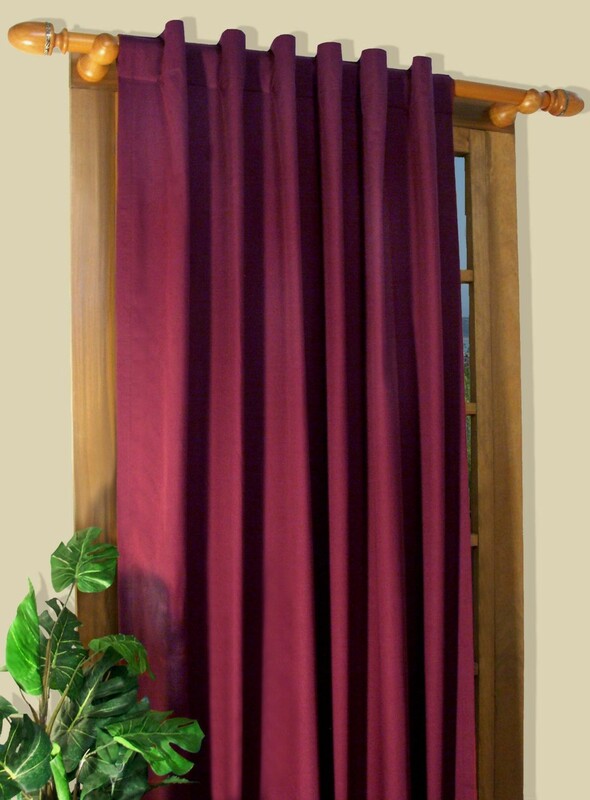 The Curtain Shop offers Grommet Top Curtain Panels from Commonwealth in a variety of popular colors at affordable prices. PANELS ARE PACKAGED AND SOLD INDIVIDUALLY. 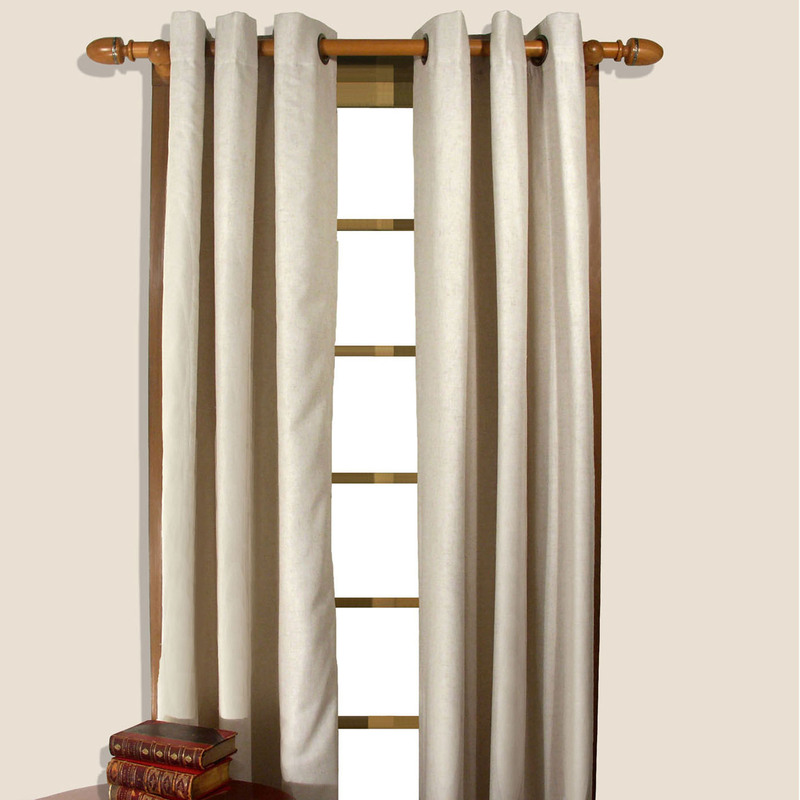 Our Grommet Top curtains are designed to fit widths up to approx. one half the width of the product. Slip grommets onto a wood or decorative pole and space evenly. Prelude offers a great color palate of insulated grommet top panels. Six Antique Brass metal grommets per panel with 1 9/16" inside diameter. 1/2" side hems, 3" bottom hem. Insulated. Fabric face is 100% Polyester, back is 100% Acrylic. Washable. It's a black out AND a thermal curtain panel all in one. 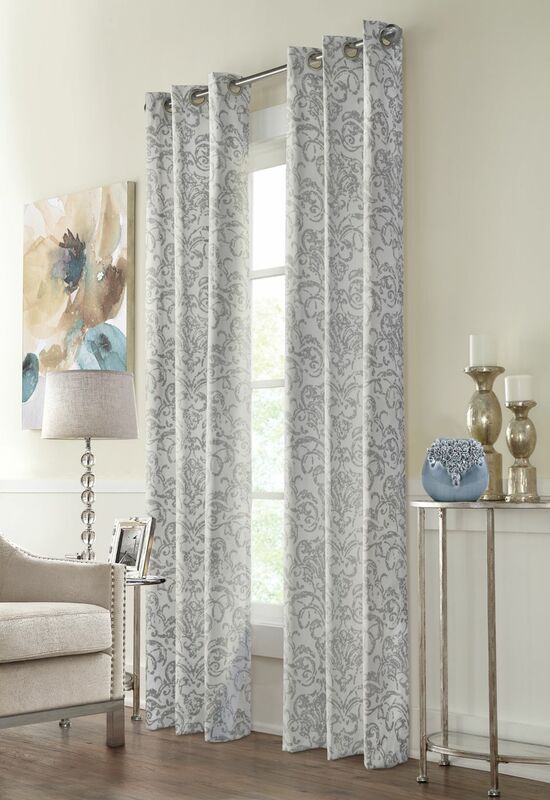 Brooke Printed Grommet curtain panel is a cut above other contemporary fabric designs. Offered a two beautiful earthy colors, it features a lovely circular printed fabric design. 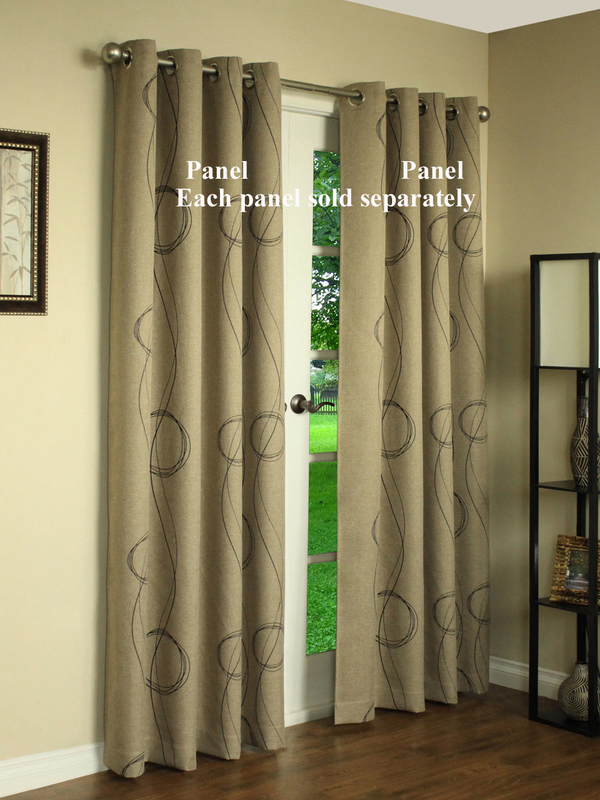 Pair Brooke Printed Grommet Panel with Brook Solid Grommet curtain panels. Thermalogics Grommet Panels keeps cool air in during the summer heat and warm air in during winter, thus saving you money on your energy bills. Also acts as a sound barrier so you can enjoy more peace and quite. Reduces glare on computer monitors and TV screens. Protects carpets and furniture from sun fading. White backing meet condominiums requirements. 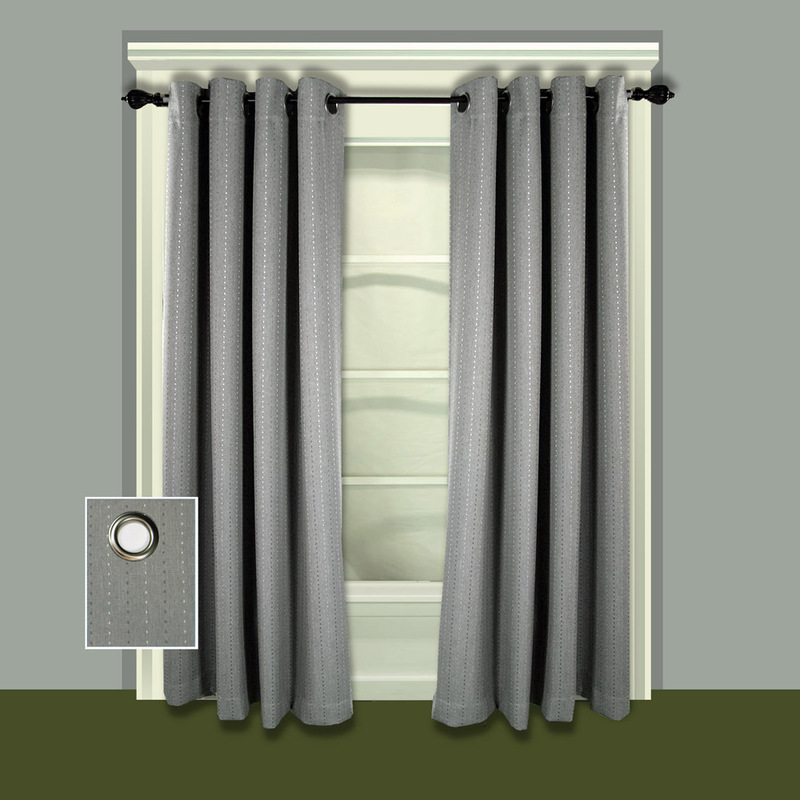 Our Grommet curtains are designed to fit widths up to approx. one half the width of the product. 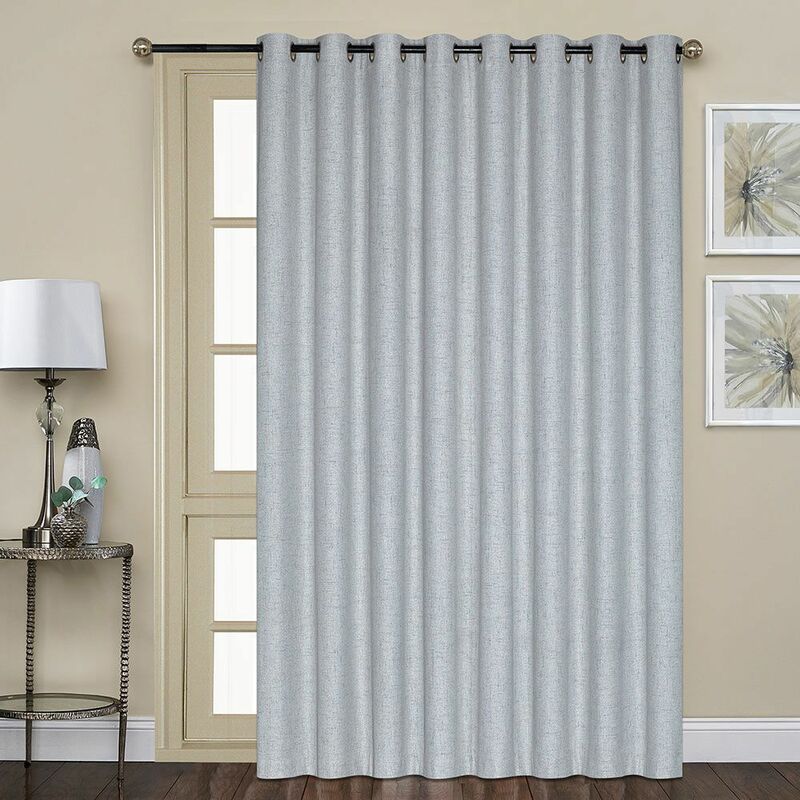 The Curtain Shop offers Grommet Top Curtain Panels from Commonwealth in a variety of popular colors at affordable prices. 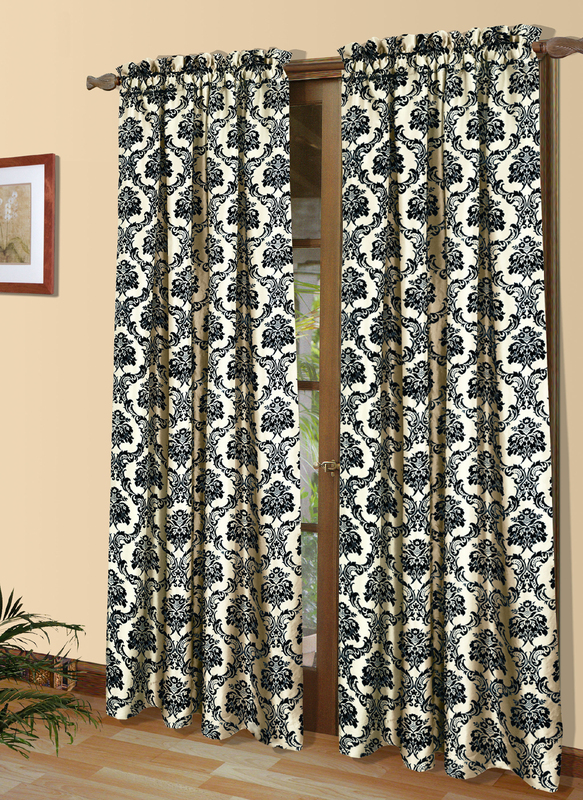 Elegant Anna Thermalace lace insulated grommet curtain pair, by Commonwealth Home Fashions, is a beautiful pair of jacquard lace curtains. Matching thermal lining makes this beauty both decorative and functional, retaining heat in the winter and cool air in the summer, thus lowering your energy costs and keeping you comfortable all year. * 1" side hems, 3" bottom hem. * Lining is attached on three sides and color matched. * Machine wash gentle cycle, in cold water, line dry. Colors: White, Natural, Terracotta, Chocolate, Blue, Navy, Sage, Khaki, Burgundy, Yellow, Coral, Aubergine, and Teal. Grommets:Antique Brass with 1 9/16" inside diameter. Each package includes two 40" wide grommet panels, six Antique Brass grommets per panel, or two 80" with twelve grommets per panel. Panels are finished with 1" side hems and 3" bottom hem. Machine wash gentle cycle cold water. Thermalogic Weathermate Grommet Panels keeps cool air in during the summer heat and warm air in during winter, thus saving you money on your energy bills. These room darkening curtain panels acts as a sound barrier so you can enjoy more peace and quite and reduces glare on computer monitors and TV screens. They also protect carpets and furniture from sun fading. The solid White backing meet condominiums requirements. Our Grommet curtains are designed to fit widths up to approximately one half the width of the product. Use multiples to accommodate wider window areas. Slip grommets onto a wood or decorative pole and space evenly. 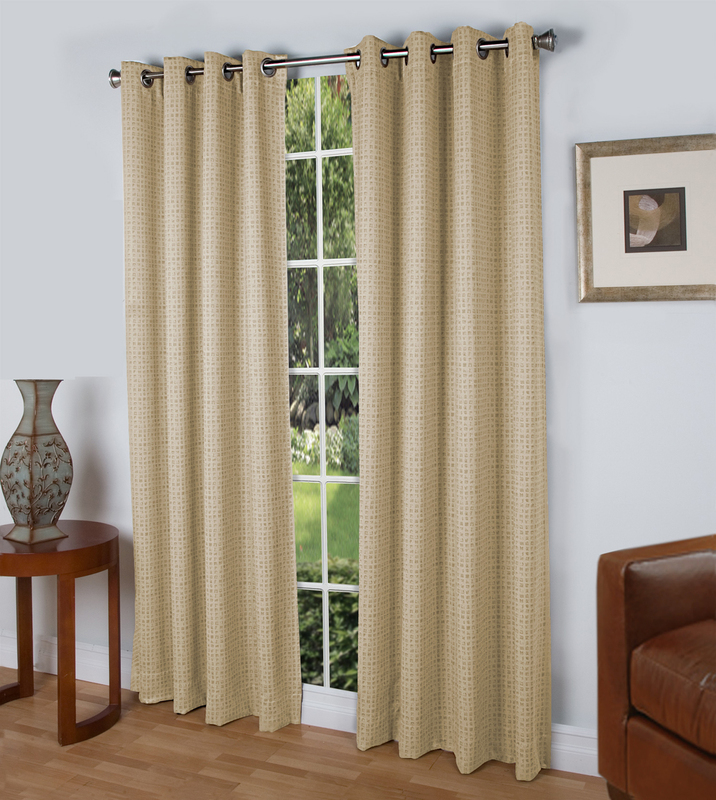 The Curtain Shop offers Grommet Top Curtain Panels from Commonwealth in a variety of popular colors at affordable prices. Grommets: 1 9/16" inside diameter. These beautiful curtain panels are a subtle Dupioni Silk lined with a soft acrylic suede backing, and looks great in any room in your home. The backing blocks outside light, minimizes drafts, and helps protect your furniture and rugs from fading. By using insulated curtains you'll live more comfortably, plus help save money on energy bills. Washable. Iron with damp towel on the fabric face ONLY, to remove wrinkles. Never touch backing with iron. * Photo illustrates two grommet panels, each sold separately (one panel per package). Use two panels for a standard single window. Grommets: Silver, measuring 1 9/16" inside diameter. Both functional and decorative, this unique Jacquard fabric is woven in three layers of black yarn for maximum room darkening and insulation capability. The fabric thickness and density help reduce outside noise, and its energy-saving properties block drafts in the winter and help keep rooms cool in the summer. The handsome fabric face is adorned with a burst of vertical dots. Machine wash in cold water on gentle cycle, tumble dry on low heat, warm iron touch up as needed. Get a good night's sleep with these gorgeous Jacquard room darkening curtain panels that work to block out light, noise and cold and hot air. 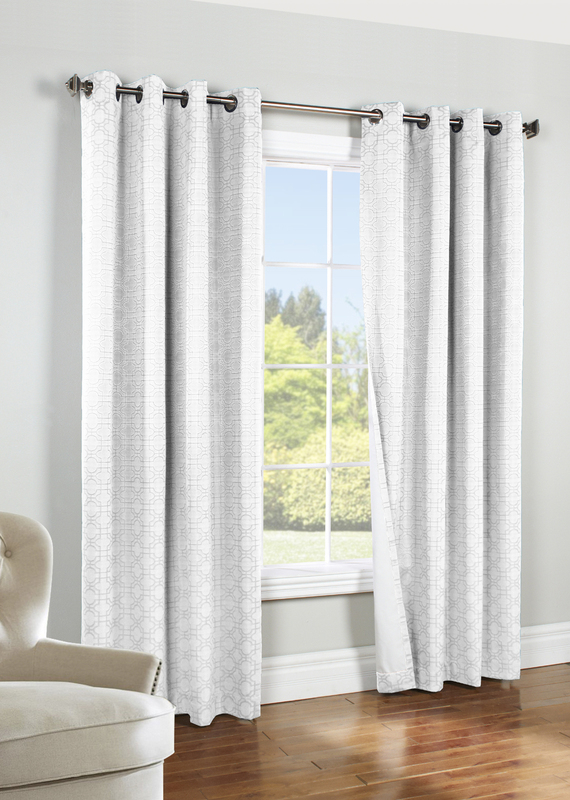 The delicate dot pattern of these fashionable drapes is a nice counterpoint to their heft. These room darkening curtain panels are doing double duty as a stylish addition to your bedroom or living room and as a way to keep the brightness and temperature in your room exactly as you like them. Grommets on top make for the simplest of hanging. 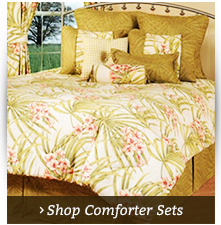 Just slide these luxurious curtains over a rod and let your head hit the pillow. Waves Grommet Top Curtain Panel is a woven jacquard featuring raised lines horizontal wavey design. Offered in two neutral colors, Taupe or Pewter and embellished with eight Silver metal grommets with 1 9/16" inside diameter. 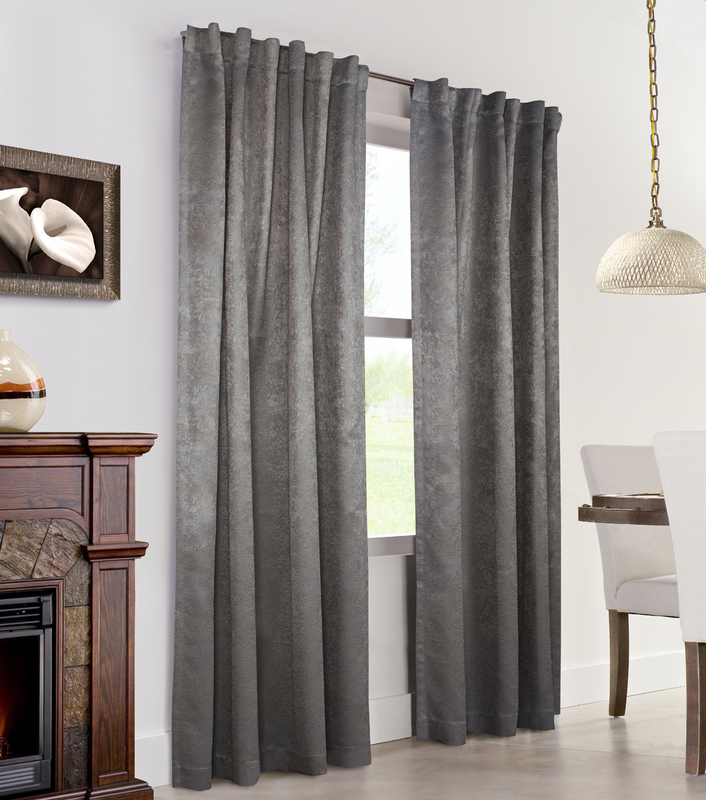 These handsome tone on tone grommet curtain panels are fully lined in Natural and provide insulation, noise control, and near black out effect. Each panel, sold separately, measures 54" wide and either 84" or 95" in length. This unique grommet panel is woven in three layers using a tight weave of colored yarns on the front and back, sandwiched around an inner layer of black out yarns. Insulated and room darkening! 112"W x 84"L Patio Panel with detachable wand. Grommet Patio panel with wand measures 112"W x 84"L.
Machine wash cold gentle cycle, tumble dry low heat, low iron touch up. Weathervane Insulated Sheer is a faux linen slubbed look made of 100% Polyester. It lets light in yet provides thermal control and privacy. Backing is 100% Thermoplastic Polyurethane. 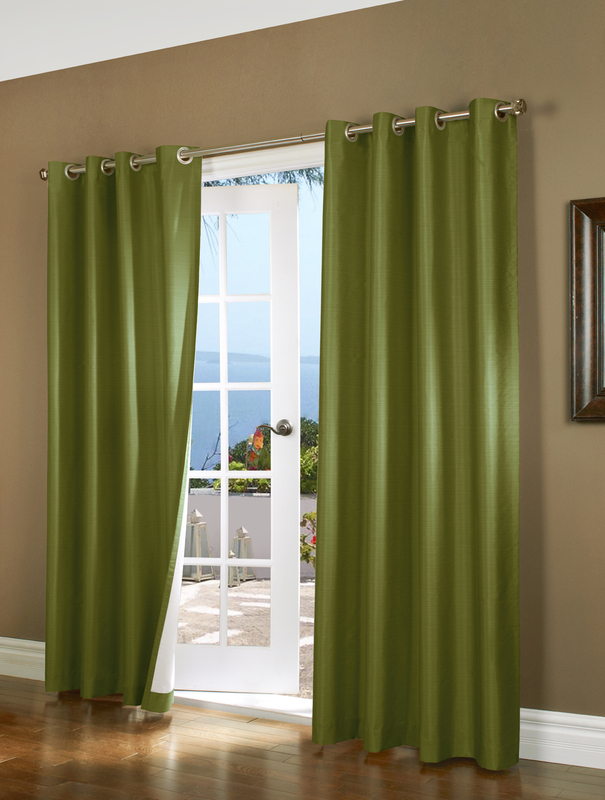 * Get benefits of an energy efficient curtain combined with the lightness of a sheer. * Certified UV protection due to light filtering aspect of the unique Thermasheer clear film on the back side. * Reduce glare on computer and TV screens. * Protect carpets, furniture and other keepsakes from sun fading. DIMENSIONS: Each panel is 50" wide and is offered in four lengths: 63", 72", 84", and 95". PANELS ARE SOLD INDIVIDUALLY, ONE PANEL PER PACKAGE. 3" rod pocket, no header, 1" side hems,3" bottom hem. Fabric Content: Face 100% Polyester, Back 100% Thermoplastic Urethane. 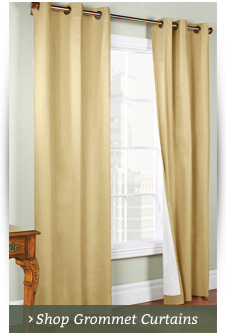 Reduce heating and cooling costs with thermal curtains from The Curtain Shop. Insulated curtains can help keep rooms warmer in the winter and cooler in the summer, reducing energy bills and making a positive impact on the environment. As an added bonus, they also help cut down on the amount of sunlight entering a room to protect furniture and carpets from fading while helping you get a better night's rest. TheCurtainShop.com offers a large selection of insulated curtains to choose from that will dress up your windows and make your home more energy efficient. Our curtains look great and help save you money. Explore The Curtain Shop's collection of thermal curtains today to find stylish options in a full range of colors and designs. 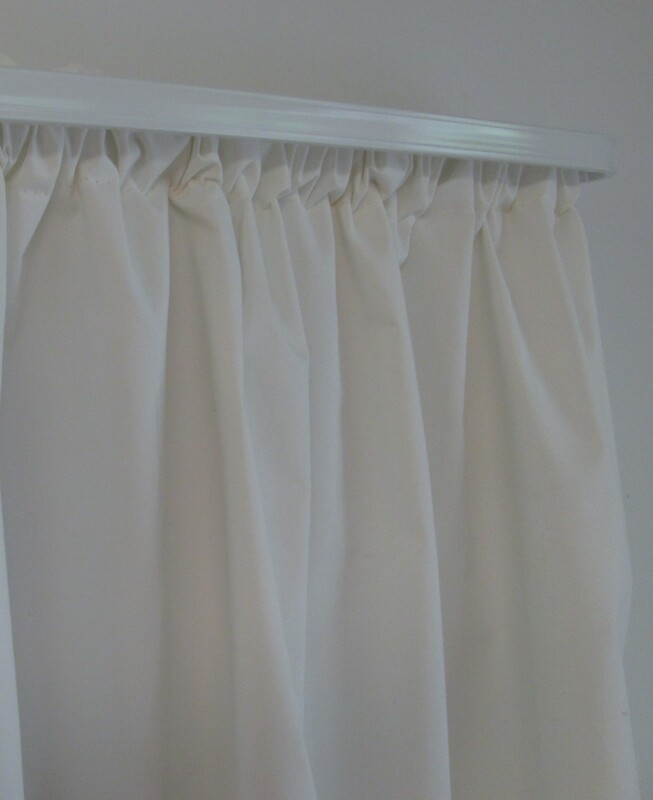 Many of our thermal curtains have a white backing which is often a requirement of condo associations. Thermal curtains can be used on full-length windows, French doors and even patio doors. Because of the thickness of the material, the curtains also help reduce noise pollution entering the home, resulting in a quieter, more peaceful living environment. Whether you're trying to turn your bedroom into peaceful oasis or keep your main living areas comfortable throughout the year, thermal curtains from The Curtain Shop can help you reach your goals. While you're here, don't forget to pick up a stylish curtain rod to hang your new insulated drapery. We carry a full range of window decorating essentials to make your home a happy and comfortable place to live.